An LED explosion proof aircraft warning light for night time marking of power plants, petrochemical masts, chimneys, oil & gas derrick and flare / offshore infrastructures. 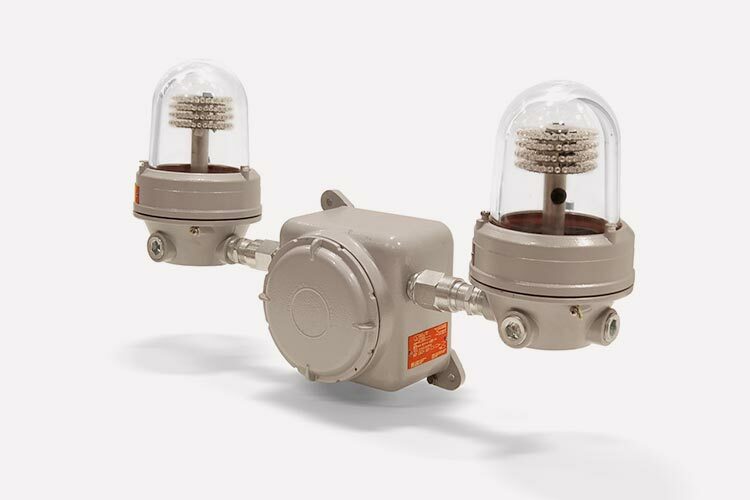 The WL-DLI-EXIIC is a low intensity duty and stand-by (dual) explosion proof aircraft warning light. In the case of the duty light failing the stand-by light will automatically switch on using the built in automatic change over relay. This unit is designed for lighting the areas that have been made hazardous by abnormal conditions resulting in the presence of highly corrosive elements, combustible dusts, and flammable gas/vapours. The enclosure is made of die casting aluminum with a powder coated finish. It is also light weight, waterproof, shockproof and corrosion resistant. The self-contained wiring compartment makes the product ease of mount. Light source consists of external long life LEDs, to ensure maximum life of the product with an output of 32candelas. Certified to ICAO Annex 14, FAA & Atex standard.